The Hard Rubber Mullen Mouth Pelham from Lorina has a thicker mouthpiece which is softer on the corners and the bars of the mouth than a thinner bit, as the pressure created by the reins is spread over a larger surface area. The hard rubber is a good alternative to the softer rubber as it is more durable against chewing and general wear and tear, so it is less likely to need replacing as often. This Mullen Mouth Pelham's main action is on the curb, the bars of the mouth and the horse's tongue, however the mouthpiece is milder than a normal jointed bit. The tightness of the curb chain has a direct affect on how much pressure is applied to the curb. This bit is designed to be used with two reins - one rein on the 'snaffle' or 'bradoon' ring, and another rein on the 'curb' ring. The pelham is very popular in the showring for children's ponies, as it teaches the children to ride with two reins without having to use a double bridle. 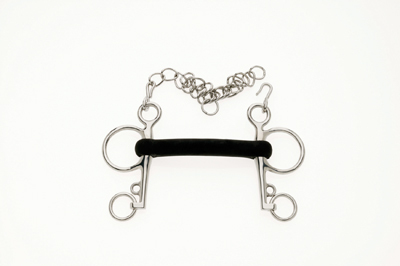 It is also widely used in eventing and showjumping as an alternative to a gag bit. This bit should be checked for general wear and tear before every use. There are currently no questions for Lorina Hard Rubber Mullen Mouth Pelham - be the first to ask one!